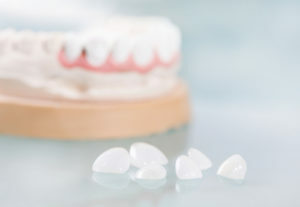 Will Porcelain Veneers Improve Your Smile? Last week we touched on the importance of cosmetic dentistry, how we can use certain procedures to improve the appearance of your smile. Today, we’re going to take a closer look at porcelain veneers. Using a porcelain restoration, we can help improve the shade and shape of your tooth. Will porcelain veneers improve your smile? What issues can they address? Answer: The restoration works by covering the front and sides of the tooth, changing the shape of the tooth, improving the color, and addressing a number of different issues. We can reshape malformed or damaged teeth, correct the appearance of minor misalignment, and even close embarrassing gaps between the teeth. Question: What does placement involve? Answer: First, we will need to prepare the teeth by removing a small layer of enamel, making room. Then, we take detailed impressions. At a dental lab, the impressions are used to fabricate the restorations from porcelain. Once complete, you will return to the office where we will check the fit and place them using a powerful bonding agent. Question: Will the restorations look natural? Answer: Yes. Each one is custom-made and created using porcelain, a material that can mimic the translucent nature of tooth enamel. As a result, the restoration actually looks natural and blends with your smile. Question: How do I maintain my new restorations? Answer: Taking care of them means taking care of your smile. You can help protect them from plaque buildup and other issues by brushing your teeth twice a day and flossing once a day. You should also have your teeth examined and cleaned at least once every six months. Doing so helps your smile remain healthy and protects your veneers.